Well the weather is starting to get nicer these days, so I thought it would be nice to get a road bike to 1) commute my two miles to work and 2) tool around with on the weekends and after work. I looked on craigslist for a while but could not really find anything worth the money while still being used. That is when I started looking for bikes in stores. 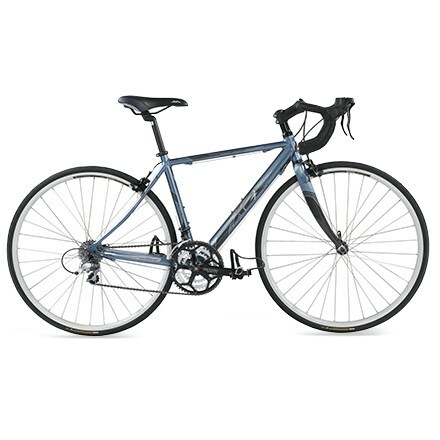 I figured if I could not find the kind of bike I wanted I would at least get some good information about what to look for. I also asked James for some pointers – thanks James. I ended up getting fixated with the K2 Mach 1 2007 from REI. I broke it in by doing a trip to work and am finding it takes me less time on the bike than the car. I am going to plan to ride to work every day when it is not raining in the morning until the rain starts this Fall again. I also want to do the Bridge Pedal in August. In the mean time if anybody wants to go for a ride sometime *cough* James *cough* Roo *cough*, give me a holler. May my dad will stop telling me I am getting fat now that I have a bike too. Sweet! I had a feeling you might break down and go new. I don’t think you’ll regret it. Don’t forget to take it in for the 30 day tuneup. Oh…and store it indoors. Druggies like shiny things. I’m planning on doing the 10 bridge ride again (36 miles). In the meantime, we’ll have to meet up at some point for some spinning. Your last car didn’t run though. I ride all the time in east Vancouver. Come over to my area, I’ll show you a good time, I promise. Or you could just buy a rocket! !